CD review: "Yes I Can! 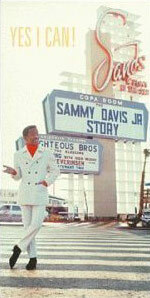 : The Sammy Davis Jr. Story"
Sammy Davis Jr. was the ultimate hipster  a smooth-talking, sharp-dressing man about town. Hanging out with his Summit buddies Frank Sinatra and Dean Martin, holding court at the swankest nightspots, escorting starlets and models out on the town, the late Davis was that rarity  a celebrity whose fame was self-made, giving him freedom from a media that was often antagonistic. As with Martin, Davis' talent as a singer was often overlooked, especially in comparison with Sinatra. Too, Davis was more than just a singer  raised as a child on the vaudeville circuit, he was part of the song-and-dance generation when an entertainer had to be able to do it all on stage. But a new collection from Rhino reminds anew just how gifted a singer Davis was. If Martin had the purest voice of the Rat Packers, Davis poured more of himself into his singing. Even Sinatra, who could break your heart with that quiver of his, never revealed his soul as fully as Davis. The difference in their reputations as singers was that Sinatra was more of a jazz and salon singer, appealing to the critics' sense of artistic purity (as well, of course, as the legions of fans who appreciated his emotional vulnerability). Davis had no pretensions of artistry projected on his music, leaving him regarded as "mere" entertainer, more in the vein of a Judy Garland than Sinatra. Sure, he could sing jazz  check out his Quincy Jones-produced album with Count Basie from the mid-'60s (two tracks from which are included here, including a stunning reading of "April in Paris")  but his signature songs were drawn from the pop canon. This four-disc set makes the listener realize just how many songs Davis either made popular, or made his own: "Me and My Shadow," "Gonna Build Me a Mountain," "Mr. Bojangles," "The Candy Man" and, of course "I Gotta Be Me." More rewarding than these old faves, though, are the surprising versions of songs generally associated with other singers. "That Old Black Magic," for instance, stands up nicely to Louis Prima's more famous version. And "Too Close for Comfort," given a completely different arrangement that Ella Fitzgerald's definitive version, more than holds its own. He even tackles Martin's signature "You're Nobody Till Somebody Loves You." The first three discs are drawn from his various studio albums trhough the yearas, ranging from the late '40s through the late '70s. The final CD is all live material from various concert albums of the same period. One of the real treats here is the inclusion of one of his comedy bits, where he does some of his celebrity impressions, including Nat "King" Cole, Louis Armstrong and a knock-dead Martin. True of nearly all Rhino releases, the booklet accompanying the music is entertaining, illuminating and first-rate. There are more than 90 pages of articles, color photos and recording information. It may be possible for someone someday to issue a larger, more comprehensive collection of Davis' music  but surely, none will be better.